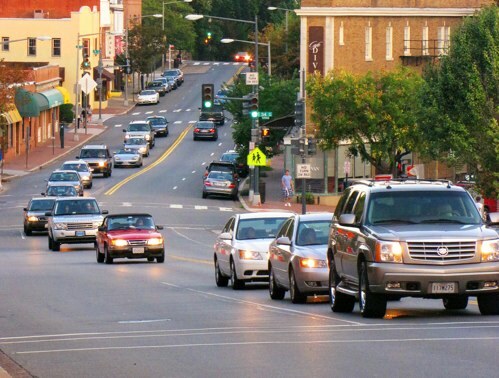 Wisconsin Avenue in DC is slated for bus corridor improvements under the TIGER grant program, which awards funding based on the extent to which a project achieves certain goals. This model should be replicated in new federal legislation. Photo: vpickering, flickr. Last week, the Senate passed its jobs legislation, which would send $19.5 billion to the highway trust fund and extend the 2005 transportation law (SAFETEA-LU). The House will act on jobs legislation this week. Among other things, the Senate bill proposes giving $932 million in grants to states using the template of 2009 earmarks. In other words, the bill would keep money flowing to the 2009 beneficiaries of two grant programs created by SAFETEA-LU, directing the majority of funding to four states (California, Washington, Louisiana, and Illinois) and leaving 22 states empty-handed. Critics of this approach, including House Transportation and Infrastructure Chairman Jim Oberstar (D-MN), would prefer to see these dollars allocated competitively rather than distributed by formula. The House jobs bill would free up the money for a merit-based process, with all 50 states eligible to submit their transport plans. As eight House members from the North Carolina delegation stated in a letter to House leaders, federal transportation dollars should fund “projects of national significance.” Prioritizing transportation investments that further national goals of economic development, environmental sustainability, safety, livability and mobility is the way of the future and the best means to ensure that taxpayer dollars are being spent on projects with long-term benefits for all Americans. As we move towards a performance-based funding system, the TIGER process provides policy makers an important opportunity to pilot and learn from the use of performance metrics. Congress should take advantage of this chance to expand a valuable grant program that paves the way for future transportation policy. In response to Oberstar’s objections, Senate Majority Leader Harry Reid has said that the funding issue will be “corrected” in later legislation, and it is essential that the Senate follow through on this commitment. Simply extending existing language perpetuates unproductive transportation funding formulas that are heavily weighted towards highways at the expense of transit, bike and pedestrian projects with their many corollary benefits, including greenhouse gas emissions reductions and higher economic multipliers. Our experience with the American Recovery and Reinvestment Act showed us that stimulus funds spent on public transportation were a more effective job creator than those spent on highways. Investments in public transit produced twice as many jobs per dollar as investments in roads. A good first step in targeting transportation funding towards projects that support national goals is the “fix-it-first” initiative currently being discussed that would prioritize the rehabilitation and operation of existing transportation infrastructure – such as repaving roads and preventative bridge maintenance – over the building of new roads. Restoring our transportation systems to a state of good repair would increase safety and reduce fuel usage. Additionally, road and bridge maintenance and repair projects have been found to generate more jobs than new road or bridge projects. As Congress works through the jobs bill this week, let’s hope that our Senators and Representatives take a comprehensive approach to boosting the economy, doing so in a manner that supports vital American priorities and paves the way for an improved federal transportation reauthorization.